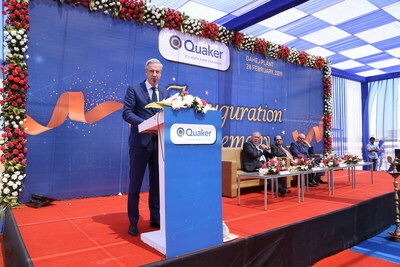 CONSHOHOCKEN, Pa., Feb. 28, 2019 /PRNewswire/ -- Quaker Chemical Corporation (NYSE: KWR) today held the grand opening of its state-of-the-art manufacturing facility in Dahej, India. The site will be used to produce rolling oils and metalworking fluids for the steel and metalworking market in India, the Middle-East, and east Africa. This is the latest operations expansion for Quaker, whose India headquarters were established in 1997 in Kolkata. Since that time, the company has continued to build a strong brand presence in the country supporting the metalworking fluids industry. "We are very proud of this achievement – the opening of a special facility in a special place. This major milestone is happening as Quaker celebrates more than 20 years in India. Today's inauguration of the Dahej Manufacturing Facility, a truly world-class and world-scale manufacturing facility, begins yet another chapter in Quaker India's already successful journey," said Gulshan Kumar Sachdev, Managing Director, Quaker Chemical India. The newly built plant combines state-of-the-art technology with Quaker's long history of manufacturing excellence and safety. The site incorporated unique features in its design, such as high efficiency induction motors to reduce energy, a water condensation recovery system, and waste water treatment technology that supports Quaker's environmental goals. The Dahej facility will add between 7,000 and 12,000 metric tons of capacity to the company's operations by the end of 2019, with plans to increase that capacity to 20,000 metric tons over the next few years. "Quaker is truly proud to add this new production capability for the benefit of our regional customers. In particular, this site strengthens Quaker's supply chain in western India, the Middle East, and eastern Africa," said Wilbert Platzer, Vice President Global Operations, EH&S and Procurement. "Together with our existing manufacturing partner, Asianol Lubricants based in Kolkata, and our warehousing infrastructure around India, Quaker is able to provide customers with an efficient, secure, and reliable supply chain they can count on." Quaker Chemical is a leading global provider of process fluids, chemical specialties, and technical expertise to a wide range of industries, including steel, aluminum, automotive, mining, aerospace, tube and pipe, cans, and others. For 100 years, Quaker has helped customers around the world achieve production efficiency, improve product quality, and lower costs through a combination of innovative technology, process knowledge, and customized services. Headquartered in Conshohocken, Pennsylvania USA, Quaker serves businesses worldwide with a network of dedicated and experienced professionals whose mission is to make a difference.